Since it finally feels like December again, it definitely feels more natural to bake up a storm. This past weekend was the big holiday bake-palooza, and after baking up dozens of cookies, I just feel like I should be baking something every day. 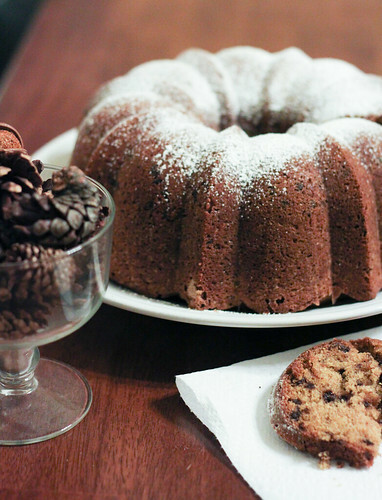 This cake is one of those things…I love baking bundt cake. They’re so pretty right out of the pan, which makes decorating them super easy. You can easily decorate bundt cakes with a thinned icing type of glaze or sifted powdered sugar. I’m loving the powdered sugar topping lately, since it looks like a layer of snow. So festive, right? This cake is a recipe that I had bookmarked for a while (story of my life), and I thought it sounded interesting…pumpkin with oatmeal in a cake. I decided to add mini chocolate chips to give it a little boost, and it came out amazing. I had some doubts since this batter was SUPER thick, but the cake came out beautifully. Preheat your oven to 350 degrees. To prep the bundt pan, either spray it with non-stick baking spray (they usually include flour in them) or just butter/flour the pan. Place the oatmeal in a small bowl, pour in the boiling water over the oatmeal and stir the mixture together. Allow the oatmeal/water mixture to stand for 10 minutes. In the bowl of a stand mixer, add the butter and sugar and beat the mixture for about 2-3 minutes, until light and fluffy. Add the eggs in one at a time, and mix until everything is well incorporated. Add the pumpkin, oatmeal/water mixture and vanilla to the wet mixture, mixing on low until everything is well mixed. With the mixer still on low, add the flour one cup at a time, and then add the spices, baking soda and salt to the mixture. Mix everything until it’s well incorporated. Pour the cake batter into the bundt cake pan, and bake the cake for 60 minutes, or until a cake tested inserted into the center comes out clean. Cool the cake in the bundt pan for 10 minutes, then invert the cake onto a cooling rack to finish cooling. Dust with powdered sugar and enjoy! Yum. I can just smell the house when this is baking …. will have to try this. Thanks for sharing.